SharePoint 2013 has a very new look. The new version of Microsoft's document sharing and collaboration tools gets the same 'Microsoft Design Language' appearance as the company's Office 2013 desktop software (with all the tools for sites either in big friendly icons on the page or neatly tucked away in a ribbon at the top), plus its own version of local sync for files and HTML-based apps you can build or buy. There are also more social features, like shared calendars and timeline and Facebook-style status posts on your personal page (what used to be called a MySite), along with tasks that sync to Outlook. It will still be available to run on your own servers, but we looked at a preview of the SharePoint Online service on the soon-to-be-available Office 365 and discovered more than just a facelift. 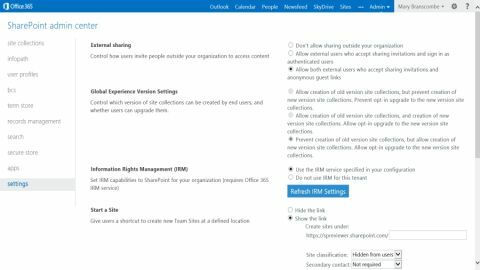 There are new tools for users to find, analyse, manage and share information, and for IT administrators, including the SharePoint Online Management Shell. Sites for personal and shared team use and document libraries still provide the heart of SharePoint. Uploading documents no longer needs Internet Explorer and an ActiveX control, as you can simply drag a document onto a site page in any modern browser. It's also a lot easier to find useful documents without having to dig through libraries, as you can search all documents without having to specify where they are in the folder hierarchy; and when you find a useful document, you can follow it as if it was a friend on Facebook. In previous versions of SharePoint, the built-in search has been somewhat basic with the separate option of the powerful FAST Search. SharePoint 2013 has a single search technology that's both simple to use (and to set up) and delivers rich results, including automatic recommendations based on your previous behaviour. Search for 'marketing deck' and results will include PowerPoint presentations (that don't have the word 'deck' anywhere in the contents), with particularly relevant slides highlighted in results. Sharing documents – with colleagues or up to 10,000 external partners and customers who don't need to have SharePoint themselves – is also much simpler. Click on the sharing option and type in names or email addresses, choose whether they can view or edit – or copy an obfuscated URL you can send in an instant message or put in a blog post. Shared documents are marked by an icon you can click to see who you're sharing with (and you can stop sharing a document when you're done collaborating). SharePoint 2013 has powerful Excel-style business intelligence tools (based on Excel Services and SQL Server 2012) for creating dashboards with charts, maps and scorecards using the latest versions of PowerPivot and Power View, so you can do something useful with the information in the documents you find. Deeper integration with Office applications also makes it easier to use the information from SharePoint. You can view and edit documents directly in updated versions of the Office Web Apps, and SharePoint 2013 adds itself to the list of places Office can save files. Personal files stored on SharePoint can be synced to your PC through SkyDrive Prom, a replacement for SharePoint Workspace, and team sites have their own mailbox and OneNote notebook to use in discussions. The new Newsfeed view also supports collaboration through SharePoint 2013. This looks very like Facebook or Yammer or Twitter; you can follow people, sites, projects, hashtags, documents and events and you'll see in the activity stream when someone does something new or makes a change (you can filter the stream to make it more manageable). You can also preview documents and videos straight from the Newsfeed, or turn any item into an action that becomes part of your task list. You use Twitter-style @ names to mention people and you can see when other people have mentioned you (you get an email as well as seeing it on the Newsfeed, so you don't have to update feverishly to stay on top of work). Also, you can post your own updates to everyone or just the team you're working with. It's easy to change the look of a SharePoint site; you can change themes and colours, drag and drop images into the site to use as the background and get a look you like without any code. Adding web parts lets you lay out site pages with more than just document libraries, and you can create different layouts for mobile viewing. Building web pages to host in SharePoint 2013 has also been made far easier; you can upload HTML pages which are automatically converted to SharePoint master pages. Or you can copy and paste code from a standard web development tool like Dreamweaver or Expression Blend instead of having to use SharePoint Designer. SharePoint is also enormously extensible, and SharePoint Online 2013 makes some important advances here. You can use it with the new Office 365 Information Rights Management service to control not just who can see a document but what they can do with it, turning off the printing and copying functions for confidential information. You can include language translation services for sites and documents, and for structured tasks you can add workflows designed in Visual Studio 2012 and have them hosted on Windows Azure. And if you need the same kind of full-trust managed .NET code that lets you customise SharePoint on your own server, you can put that on Windows Azure; as a multi-tenant cloud service, SharePoint Online has to protect users from each other's potentially performance-hogging code, so this is a sensible approach. But you can now get apps for many of the functions that would previously have needed customisation. These are written in HTML and CSS so web developers can create their own, but you'll find plenty of useful business apps already in the SharePoint store, from WordPress blog hosting to mapping tools. Administrators can control which apps are available from the store (and who can buy more). SharePoint started out as a collection of shared document libraries and has morphed into a much more powerful system that can act as your intranet and business social network, and host your external web site. It's changed from being a server system you install and customise to a cloud service you can subscribe to and scale out, with custom code hosted on Windows Azure (though the on-premise server option is still there for organisations that want to customise and maintain their own system) and use from tablets and phones. The new release is easier than ever to get started with, for IT administrators and for end users. You can use it to share and find information, to analyse it with the business intelligence tools, to plan a project with the new timelines and shared notebooks, to discuss it (in email or the Facebook-like newsfeed) – and to protect and manage it, with rights management and access control (within your own company and for external partners) and legal holds. SharePoint can do a vast amount of what most businesses need to organise themselves. Ironically, the main drawback is the fact that SharePoint 2013 is so comprehensive. It takes time to figure out everything you can do, and to get the most out of it you need to get everyone to put their documents and thoughts and analyses into SharePoint sites. If you can get the critical mass of information and usage, the new interface and tools will make SharePoint 2013 an extremely valuable business tool. And unless you need to keep on-premise customisation you're not comfortable moving to Azure, the SharePoint Online service on Office 365 is the simplest and most cost-effective way of getting it.